It’s the holiday season yet again- The time of the year where we can show our gratitude for our friends, families and loved ones. Christmas shopping, however, can be a stressful experience for many people, and busy shopping centers crowded with cliche gift options are not everyone’s ideas of a good way to spend our precious holiday hours. To this end, Greenpop, a Cape Town based social enterprise aimed at greening and sustainable living,has just launched an online POP UP shop: www.greenpopupshop.com equipped with loads of suitable, fun and thoughtful gifts for this festive season. 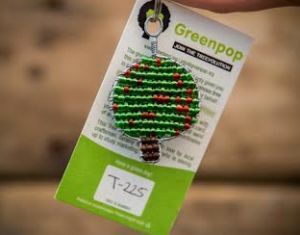 The shop features green gifts such as Greenpop hemp caps and snoods, awesome water bottles that have info graphics on water and the text ‘this is tap water,’ and Christmas cards that are printed on ‘growing paper’ with embedded seeds, so that they can be planted. The shop also features ‘tree rings,’ wire key rings that represent a tree that we’ll plant on someone’s behalf. Each tree ring comes with a unique code, which allows people to go to our website and get their personal certificate with the GPS coordinates of their tree. Greenpop is a social enterprise that believes greening and sustainable living can be fun, POPular and accessible for all. We believe in inspiring a greener, more conscious, inclusive movement and do this through tree planting projects, green action events, education, social media, voluntourism and activating people to start DOING! Greenpop started in September 2010 and has since planted almost 30 000 trees in over 250 beneficiary schools, crèches, old-age homes, community centres as well as deforested areas in Southern Africa. Creative tree-care programmes have been implemented and children, community members and volunteers are getting their hands dirty, learning a lot and loving it. Greenpop is inspired by the exciting projects we have coming up and the bright green future we see for Africa.